After years of service to the professional community under 35, group leadership asserts new mission to connect and educate the broader advocacy community in Washington, DC. 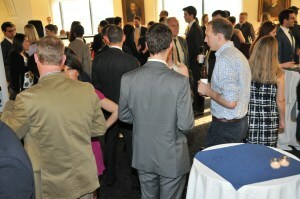 Thanks to the over 250 people who attended the Filibuster & Festivities event on April 21 at the SunTrust building. We were excited by the turnout, and glad that we were able to announce our formation of the Government Affairs Industry Network (GAIN) to such a supportive and receptive crowd. We would like to offer a special word of thanks to our co-hosts, the Grassroots Professional Network (GPN) for their amazing help in organizing and facilitating this successful endeavor. And to our generous, wonderful sponsors: thank you! We could not have made this event successful without you. Shout out to Advocacy Day Assistant, Beekeeper Group, CQ Roll Call Cygnal, GovPredict, KnowWho, L2 Political, Rap Index, Soft Edge, and Vox Global for your valuable support.